Through the years, Brian Davis has been asked to try all sorts of 'wonder products' -- a process that has made him so skeptical that he tests almost everything he sees. As he discusses here, that included a thermo-polymer option to Portland cement-based pool finishes. As a general contractor, I am steadily bombarded by information about new products that claim they will forever change the way I look at whatever category the novel gizmo occupies. This sort of marketing has turned me into a skeptic whenever I see something new come along, basically because experience and communication with other contractors have showed me that few of these novelties ever fully live up to the hype. Some contractors respond to this slippery situation by sticking solely with what they know, which, in my view, is an easy way to get stuck in the past. I avoid that rut to the greatest degree possible, basically because I’ve occasionally found worthy newcomers that are either labor-saving, cost-effective or have some other virtue that wins me over. This is why I dig in, review the information as presented, set aside the stuff that makes no sense or has limited promise and then test the ones I see as having real potential. Part of my business for some years now has involved renovating swimming pools, spas and other waterfeatures in the course of working on homes in the vicinity of Riverside, Calif., where my company, Davis Custom Construction (Lake Mathews, Calif.) is most active. 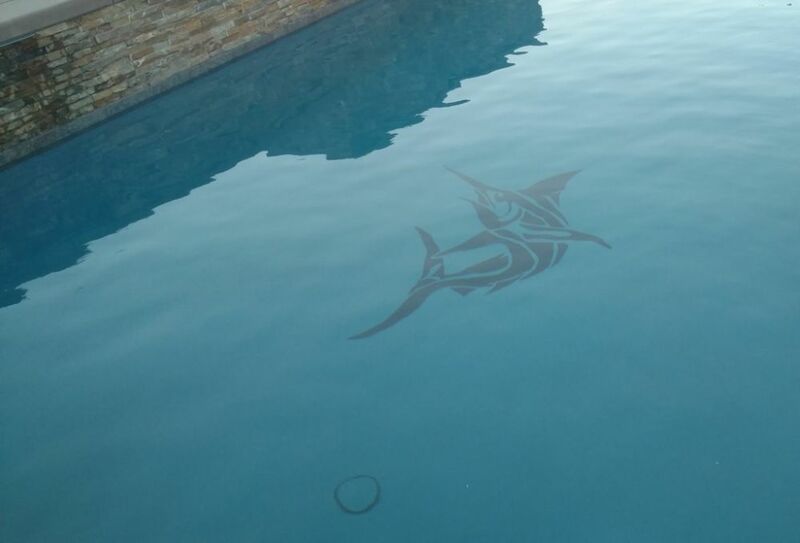 My curiosity about finding an alternative to traditional interior pool finishes is what led me to write this article. 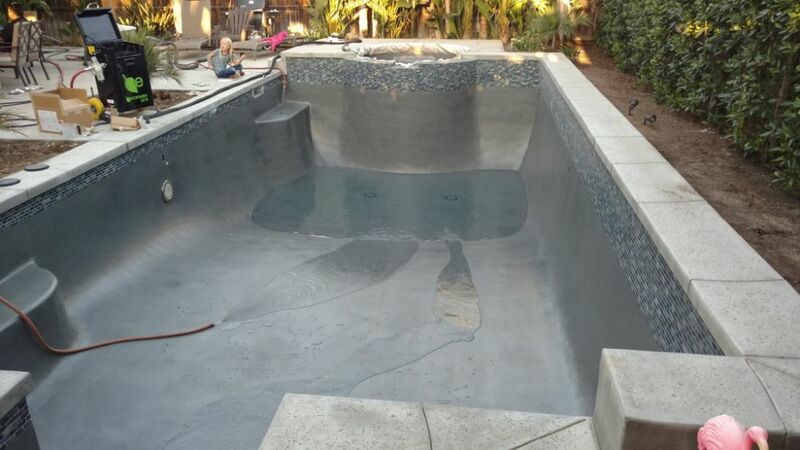 For decades, plaster has been the material of choice for many if not most pools, spas and waterfeatures as their finishing membrane – and for good reason, because plaster is inexpensive, durable and widely suited to different applications and aesthetic needs. In recent times, the plaster matrix has been further advanced by adding quartz, pebble and glass aggregates to enhance the look and longevity of the surface. These additions and enhancements have increased the lifespan and look of these finishes, but they do nothing to overcome the fact that cementitious materials are, unless properly applied and contained in a proper chemical environment, subject to issues ranging from discoloration and surface cracking to other phenomena that compromise aesthetics and make clients less than happy with the outcome. Simply put, the difficulty involved in delivering consistent, reliable, long-lasting results for my clients has kept me on the lookout for alternatives. My heart’s desire? A finish that, once applied, will be trouble-free with minimal routine maintenance or daily concern about the finer points of water chemistry. Surface preparation with an older, plaster-lined pool can be quite involved, as the objective with the polymer finish is to start with as smooth a substrate as possible (left) Once it’s ready, the material is applied and inspected (middle left), after which water can be introduced from any source for subsequent balancing (middle right). The results (right) align with clients’ expectations for appearance without the stresses associated with starting up a plaster pool. This quest has led me down a few odd paths through the years, but short of trying to persuade my clients to go with all-tile finishes, I never found anything that seemed to offer me the answer I wanted. Not long ago, however, I came across AquaBright, which had enough promise that I decided to investigate – as always, with a skeptical eye. 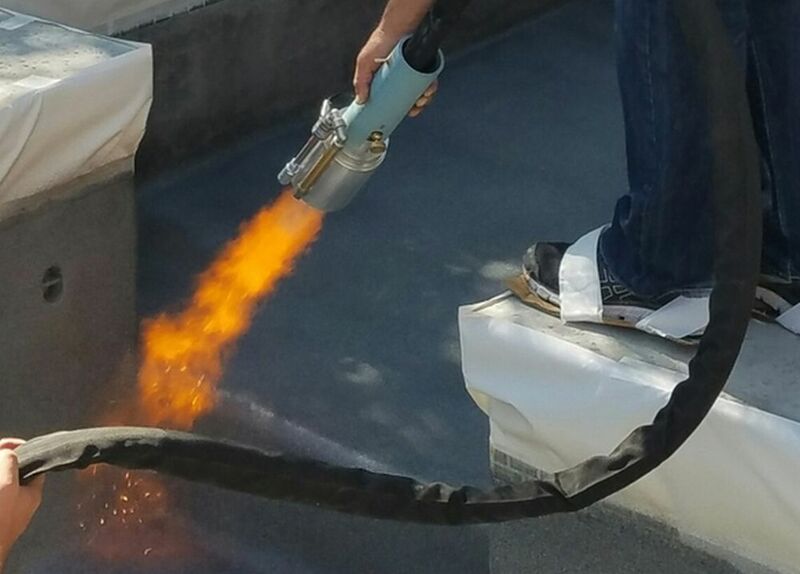 This material, made by ecoFinish of Warminster, Pa., is a flame-sprayed thermo-polymer that the manufacturer describes as inert and therefore immune to the ravages of pool treatments or water-chemistry imbalances; stable in ultraviolet light and therefore colorfast; and durable and smooth as well as aesthetically pleasing. It is also claimed to form a completely impervious waterproofing membrane for pools, spas, waterslides, fountains and all waterfeatures. I’d seen claims like these before, but in this case, I was impressed by what I’d learned. Among other things, its inertness made sense in aquatic environments. It doesn’t rely on water for hydration, so it isn’t subject to drying or shrinkage cracks. 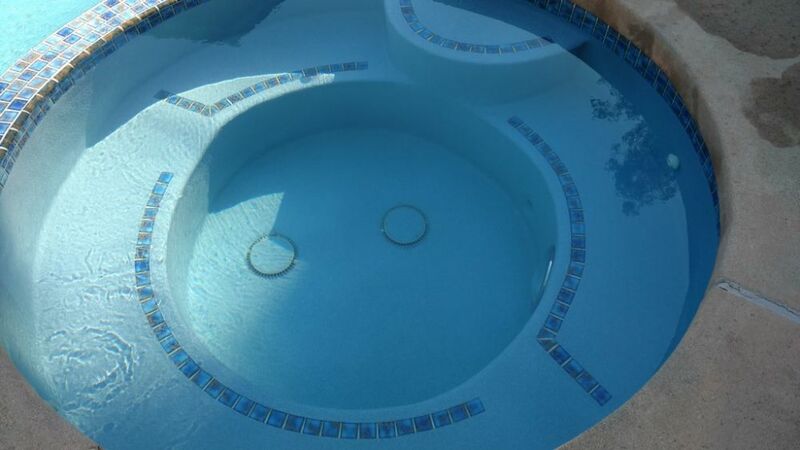 It can also be used either fully or partly submerged – meaning for one thing that it can be used in watershapes without the customary waterline tile and, for another, that it is a good fit with beach entries and waterslides. All of this led me to reach out to the supplier, at which point I was invited to visit its headquarters in Pennsylvania. I came home to California loaded with samples applied to various substrates and was determined to put them through the same sorts of challenges to which I’ve always subjected samples of plaster finishes and other non-plaster alternatives. Once ready, some samples were placed into a container of full-strength muriatic acid, while others went into full-strength chlorine. The changes with the plaster samples were often profound, but the samples of the polymer material were unaffected by the chemical insult and showed no surface discoloration, fading or roughening. Given the nature of the material, I also subjected the polymer samples to a scratch test, gouging out a strip of material to see how the finish responded. The result was unsightly, but when I applied heat to it for a few minutes, the scratch lost its defining edges and the blemish became difficult to spot. Similarly scratched cementitious finishes would prove more difficult to repair without leaving visual traces. The thermo-polymer material adapts to all sorts of features associated with fine watershaping, including masked drain inlets (left), beautiful tile details (middle) and inclusion of mosaics (right) – in this case made with a stencil and brought to the foreground by applying a different color of the polymer material. I was impressed enough by my findings that I decided to become a licensed applicator of the polymer material. 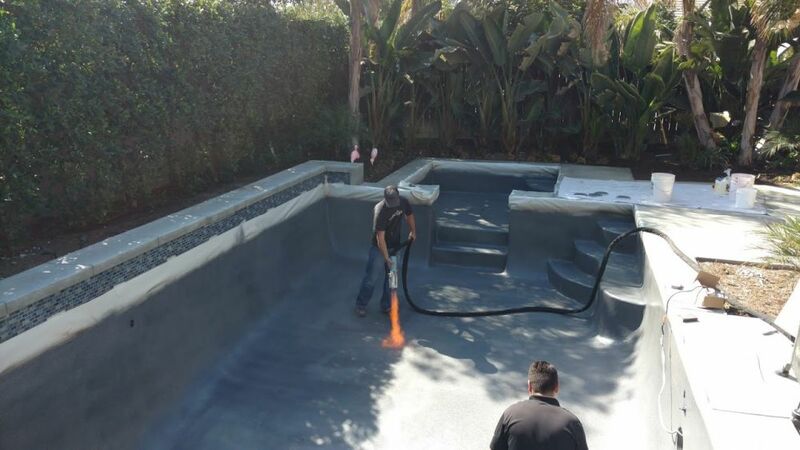 The installation process consists of preparing the substrate with a thorough cleaning (both acid and pressure washes), masking the waterline tile (if present) and applying two coats of a two-part epoxy-resin bonding agent. After that, the AquaBright powder is pneumatically applied, drawn from a hopper to a nozzle where it passes through an intense propane flame on its way to the substrate. The heat melts the polymer as it is propelled. When it hits the surface being coated, it forms a uniform layer about 1/32nd of an inch thick that is walkable within a few seconds. This process produces strong chemical, thermal and mechanical bonds, so much so that removal of the material is nearly impossible without also removing the substrate. The resulting surface has a fine, orange-peel texture, but it can also be applied to have a non-slip finish similar to fine-grit sandpaper. Once installation is complete and the surface has been inspected, the vessel can, because of the material’s inertness, be filled without complex start-up procedures, acid washes or any measures beyond bringing the water directly into acceptable balance. Swimming can commence right away, and so can heating. Some of the material’s virtues in swimming pools are magnified in fountains, waterfalls and splash pads, where extreme aeration (and the resulting carbon dioxide outgassing) can lead to rapid pH rise. To combat this, the alkalinity in polymer-lined watershapes can be lowered to levels far below what is recommended for plaster surfaces: Higher alkalinity levels are not required to protect the surface from deterioration. The non-porous polymer surface is also stain- and scale-resistant: There’s nothing for stains or scale to cling to, and in the event any issues arise over time, a simple acid washing can restore the finish to like-new appearance – all without shortening its lifespan. It’s also a flexible finish, so it won’t crack. As with any finish, of course, the polymer material has its own set of requirements: For one thing, it needs a smooth substrate, meaning it can’t be applied directly to gunite or shotcrete without projecting imperfections through to the surface. This also poses problems in refinishing old plaster coatings: Typical filling and patching to smooth these surfaces before application of the polymer may fail in the presence of the intense heat of polymer application. The polymer finish can be used with all watershapes on many common substrates, which makes it useful for battered (yet beautifully restorable) small fountains (top left, middle left and middle right) as well as wet/dry features such as water slides (right and bottom left). Ironically, the ideal substrate for polymer application may well be a new plaster finish, which significantly increases project costs and is definitely a limiting factor in recommending use of the polymer product. In my research, I dug into the manufacturer’s own testing and was pleased to find it to be both thorough and disciplined. There are reports on tests of chemical resistance, adhesion, flexibility, hardness, resistance to impact, weathering and more – enough to assure my skeptical soul that they back the product up with ongoing quality control and research. There are some downsides, however, including the fact that the product has been used in watershapes only since 2008, which, despite the supplier’s accelerated testing procedures, makes it tough to reach conclusions about long-term performance. In my case, the first pool I finished with the polymer material is little more than a year old. Even so, I’ve seen enough to be confident about the product’s integrity for the long haul. A more important drawback is that the product is relatively expensive. Where I work, it costs many times more than a basic white-plaster finish (although, to be fair, in my market plaster finishes are truly inexpensive). Part of the cost is in labor, because it takes significantly longer to apply and requires fully trained applicators. Part of it, in my case, is the cost of shipping the material from Pennsylvania. There’s also the fact that the application equipment is very specific to the product: It’s pretty basic, but it’s neither inexpensive nor suited to any other use. To my way of thinking, it’s awkward at best that the surface to be coated needs to be so smooth and sound – almost as if the watershape needs a new-plaster finish as a substrate for the polymer to produce the desired results. 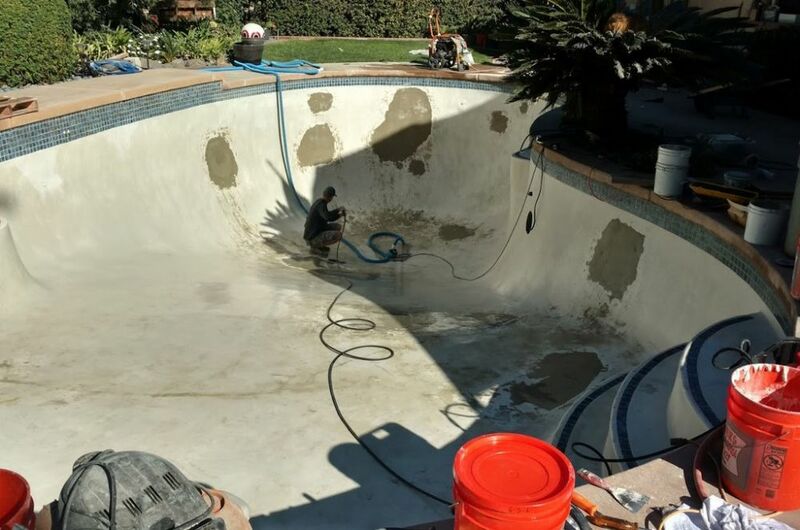 This puts limits on using the product in renovations: A new-plaster level of smoothness is hard to come by in typical old-plaster pools, where, because of the expense, refinishing is often put off until the plaster is in desperate need. To make the polymer finish work in these cases, time-consuming patching must be done, and as reported above, delaminations can result (sometimes with explosive results) when the flames are applied. In cases where the surface is so bad that it needs to be replastered, the client effectively pays for demolition as well as two surfaces – not a comforting possibility. The upshot is that this product can’t be recommended for every contractor or every project – and that’s as true with new construction as it is with renovations. Just the same, I see the product’s virtues, plain as day. My intention here has been to present what I know so that AquaBright’s considerable merits can be weighed against its demerits. Along the way, I hope that approaches can be found that will make the material as useful as anyone who specifies or applies it would like it to be. Finding those approaches – including a foolproof way to repair old plaster surfaces short of replastering – may take time, but for now, I am content to look at the polymer material as a worthy alternative to plaster – not a substitute or replacement, but definitely a product to consider for the right client and the right watershape.